The god of cycling had clearly turned his face away from us – since our bad luck seemed to linger on…. 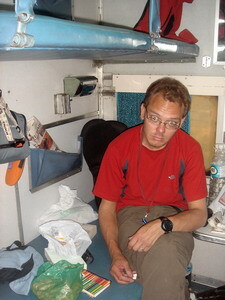 We managed to get to Calcutta in an overnight train (cramped accommodation even in first class berths!) – unfortunately minus the bikes… The luggage compartment on our train was locked which meant the bikes had to be sent on separately. When? No one could tell us. A phone number? There wasn’t one. We were given a ticket with a reference number on it and that was it. 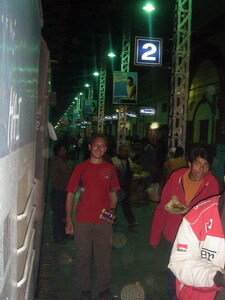 We got on the train, hoping for the best (fearing the worst), wondering if we would ever see our bikes again. It really felt like leaving our kids behind!! Once in the comfortable confines of our friend’s house, we found out that a parcel from Europe containing some essential replacement bike parts was being held in customs, with an outrageous customs duty charge to pay (worth approximately 200 pounds). Ordinarily this would be fairly quick to resolve in Europe – however this too, like most things in India, was to prove a long-winded and inconsistent process. The customs duty kept going up and down daily, almost seemingly depending on the mood of the UPS clerk!! One high point though was the fact that, having finally received some medical attention, Nic’s ear began to show signs of recovery. Perhaps our luck was finally turning…?